These 10" HMI screens are ideal for a wide range of applications thanks to a comfortable screen size, great connectivity and mid-range specs. This series can communicate with up to 8 different PLCs, drives, and temperature control protocols, which allows you to simultaneously exchange the data as a gateway (via USB port A and B, serial ports and CF card interface). Each model is also compatible with the MSDE/SQL database as well as a USB mouse, keyboard and printer. and 12.5Mb of display Mem. With a bright, high resolution touch screen, sophisticated design and extensive connectivity, the new Monitouch TechnoShot is an ideal HMI Touch panel for most applications. The very aggressive pricing of the series gives it a major competitive advantage and is likely to satisfy the most demanding customers. Models from the Technoshot series include 2 x USB ports (master/slave) and 3 x serial ports. Technoshot has an incredibly long list of compatible device drivers that can be used individually or together to form a data gathering network, without the limitations of working with a single manufacturer. Data can be gathered from one PLC, stored, displayed and shared with other devices in the network. True flexibility in data displays with the ultimate in connectivity. 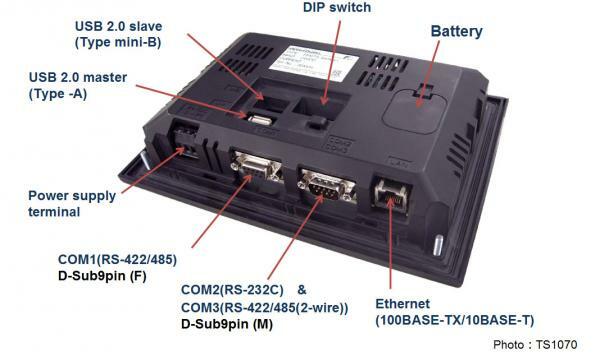 Connect with up to eight different communication buses from different manufacturers by using Ethernet and serial communication. * 1 Available only when connected with SIEMENS MPI. *2 Keep wet bulb temperature under 39 degC. *3 Option. All of the above variations of Technoshot are configured using a PC software application called V-SFT5, which provides drivers, ready built libraries of graphics for graphics to display data, graphs, trends, lamps. buttons and switches. In fact you can create any graphical image and turn it into a switch that will interact directly with your PLC or any other device on your network. V-SFT5 is being updated on a regular basis and all updates are free! When you have to deal with a large amount of information from your production site, a Hakko Monitouch touch screen can make the difference. Powerful, well connected and easy to use these intelligent screens allow you to design custom screens with simple instructions for your operators, while performing complex production tasks on the background. We offer a low cost "inspect and evaluate" service that identifies faulty parts that can be repaced from our stocks, or ordered to specific requirement. 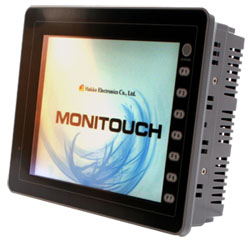 The Hakko Monitouch range of HMI's are reliable and robust. Most units that are returned to us have either suffered from misuse or they have enjoyed many years of service and would therefore benefit from, a new front panel, a replacement back up battery and/or a back light.